Portuguese police have named both parents of Madeleine McCann as formal suspects in her disappearance. Gerry McCann was officially given "arguido" status about 12 hours after his wife Kate. They had been questioned separately for more than 24 hours. No bail conditions or charges have been imposed and both deny any involvement in Madeleine's disappearance on 3 May. Earlier, a family spokesman said Portuguese police believed Kate McCann had killed her daughter accidentally. Asked whether the couple, both 39, were still protesting their innocence, family spokesman David Hughes said: "They certainly are." Mr McCann refused to speak to reporters as he left police headquarters in Portimao after eight hours of questioning. It is understood Kate McCann was told she would only face two years in prison if she confessed. She underwent a second day of questioning on Friday. Under Portuguese law, police are not allowed to publicly give details of ongoing investigations. Jon Corner, a close family friend, said Kate McCann had told him officers had tried to "cut her a deal" where she would only serve two years in jail. He added that she was feeling "very down, very low" and "deflated". Another family representative said officers believed that traces of four-year-old Madeleine's blood were in the McCanns' car, hired 25 days after she vanished. Mr McCann arrived at the police headquarters at 1535 BST. He was not questioned with Mrs McCann, who left shortly afterwards. The "suspect" status allows the authorities to put certain questions to Mr and Mrs McCann, and also gives them the right to remain silent. The first formal suspect was Robert Murat, a British man living locally. Mr and Mrs McCann have not been arrested or charged. 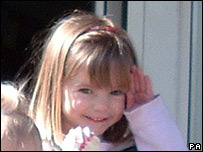 McCann family spokesman David Hughes said: "She is suspected of accidentally killing her daughter." 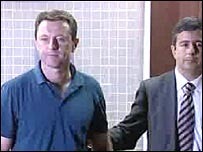 In his latest diary entry on a website publicising the search for Madeleine, Mr McCann wrote: "The suggestion that Kate is involved in Madeleine's disappearance is ludicrous. "Anyone who knows anything about 3 May knows that Kate is completely innocent. We will fight this all the way and we will not stop looking for Madeleine." Meanwhile, friends of the family said that Mrs McCann has been told by her lawyer that she could be charged in connection with the disappearance of her daughter. It is understood that after questioning Mrs McCann on Thursday, police said they had 22 questions they wanted to ask her during Friday's interview. The McCanns, from Rothley, Leicestershire, say they left Madeleine in the family's holiday apartment in Praia da Luz while they went to eat in a nearby restaurant. Mrs McCann had been interviewed by police the day after Madeleine disappeared, but Thursday was the first time her lawyer had been present. In a statement released before her interview on Thursday, she appealed to her daughter's abductors, saying: "It is not too late - please let her go or call the police." She said: "We came to Portugal an ordinary family of five. We just want to know what happened on 3 May and want to be able to go home one family, reunited." A British sniffer dog picked up the scent of a dead body in the apartment and samples, including suspected traces of blood, have been recovered from the scene. The UK's Forensic Science Service has spent the past month analysing them.